Golden fingers caress the eastern sky, drawing back the darkness and the sense of mystery that blankets this ethereal landscape. The playing of light and shadows across the mountain peaks seems to evoke a spiritual presence. It is the dawning of a new day in the Lamar Valley, a magical landscape that must be felt, as words fail to describe the sublime sense of serenity this wild landscape evokes. Time spent at the Lamar Buffalo Ranch, immersing oneself in nature, can be soul-cleansing. It opens the senses more fully, forces us to move “in the moment”. Nothing here feels commonplace, from the robin who sings her melodious morning song perched on a rustic cabin, to the lyrical gurgling of the swollen stream that rushes past the ranch, to the tiny barn swallows perfecting their aerial dance above. Everything is observed through a microcosm of acute clarity. The lyrical sound of Rose Creek is always welcome. The air smells like sage, sunshine, and fecund earth. Winter snow melt and spring rains provide Lamar a cool, deep drink, resulting in a verdant valley. Springtime heralds the arrival of the “red dogs”, bison calves cavorting in the supple green grasses, never far from mom when they feel the need to suckle. The swollen streams that rush through the valley in the spring slow to a languid crawl in summer and bison graze placidly along the valley floor as far as the eye can see. As the lushness of spring surrenders to the warming of late summer, snorts and bellowing grunts carry over the breeze, broadcasting the “rut”, the bison’s mating season, when bull dominance ranking is challenged. Bison dot the landscape of the Lamar Valley. Beyond the human sight, wolf, grizzly, and coyote roam the shadows of the forest edges, awaiting that perfect moment when they are called to action, with the chance to provide a needed meal for their hungry families. A familiar wolf pack, the Junction Butte pack, can often be seen hunting in the valley, reminding us of the disquieting nature that is the circle of life in the wild. There is a poetic justice to knowing that these predators are part of the fabric of this lush landscape. One can feel the sense of timelessness here in the Lamar Valley. As the sun sinks lower into the western sky, the trumpeting call of the sandhill cranes wafts across the deepening shadows. The majestic mountains looming over the valley floor reflect the geologic clashing of the forces of nature, and remind us of the intimate connection we all have with the wilderness, no matter our place in life. To lose any part of these untrammeled wild spaces would mean a loss of part of our humanity. 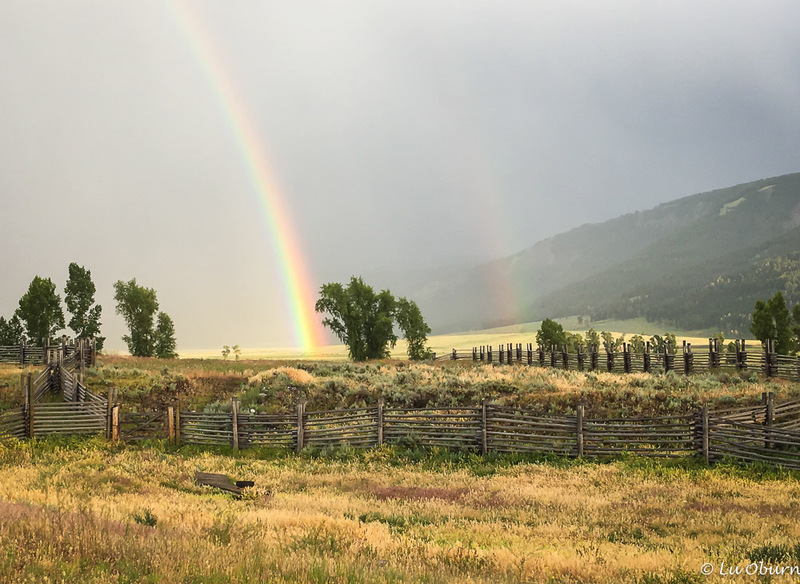 A double rainbow emerges over the Lamar Buffalo Ranch following an afternoon rain shower. 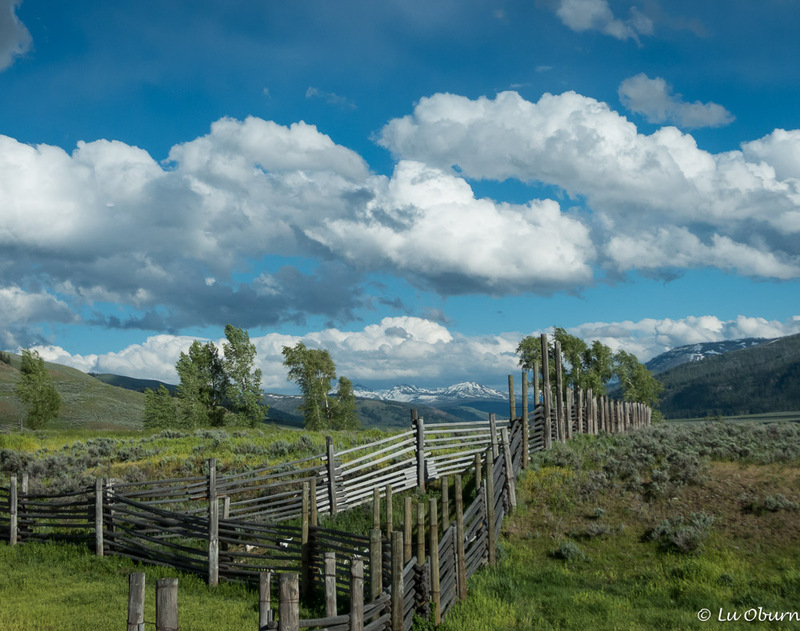 The Lamar Buffalo Ranch is an intrinsic thread woven into the Yellowstone history. A visit to the park would be incomplete without experiencing the magic of the Lamar Valley. Oh what a beautiful post! Your words and pictures transported me to a place of peace and beauty. You must be having a truly wonderful summer. Thanks Alison! It certainly has been a special summer. Looking forward to catching up with the two of you soon. You are so sweet Frank. Thanks so much. This place really speaks to me. An absolutely stunning post ~ both your gorgeous photographs and your words which create a painting in and of themselves. I love love that first photograph with the dramatic sky over the cottages and the last photograph with the soft double rainbow over the ranch. Nothing is as wonderful as being immersed in nature and the Lamar Valley looks as if it is spectacular. I would love to visit one day. Thank you! Thanks so much for your comment Peta. Total immersion into nature makes for a wonderful summer. Looking forward to seeing what the two of you are up to when I have more internet available to me. What an amazing gift you have with words! And your pictures are exquisite! Thank you for your post! Has been awhile! Look forward to your next. Thanks so much Carol. I have so much material for future posts, so stay tuned! Beautiful thoughts and photos. Thank you for taking me to this stunning place where you are getting to spend an entire summer! My pleasure Lisa. I look forward to the time when I have unlimited internet again so I can catch up with everyone. Hope you and Hans are having a wonderful summer! i didn’t know there was a Buffalo Ranch in YNP! What is its purpose? As always your photos are gorgeous. Always makes me wish I were there. Thanks Gale. Lamar Buffalo Ranch is in the Lamar Valley. It is no longer used as a buffalo ranch but once was when the bison herd had deteriorated to less than two dozen head. Now it is a campus for students who participate in field seminars and other programs. Such a perfect description of this magnificent place. Beautifully written, Lu!! I can’t wait to sit down with you two and hear all about this summer. You are really making me miss Yellowstone. A revisit needs to be on our calendar real soon!! Thanks so much Pam. It has been a wonderful experience. The only loss I feel is not keeping up with the rest of the bloggers. I have a lot of reading (and writing) to do when internet is not an issue for us. Hope you and John are having a wonderful summer. Thanks so much Roger and Gail. It has been a unique experience, filled with wonder and awe. I have lots of writing to do when internet is more plentiful. Hope you two are having a fabulous summer! What a perfect place to spend the summer. Look forward to the rest of your posts! Thanks Jim and Gayle. Wish you guys were here too. I have lots of catching up to do on so many blogs. Hope you are having a great summer. I barely can keep my mind on the words of this post. I can’t get past the absolutely gorgeous photos. You, my friend, are a professional! And you, my friend, are very sweet. As I’ve told others, this has been a summer of wonder, awe, and much learning. I only wish internet wasn’t so sketchy so I could keep up with my blogger friends. Hope you and Paul are having a great summer. We are having a bit of a challenging summer but making the best of it. Dad is going to be 90 in November and has been the in the hospital four times. A bit stressful to say the least but is doing much, much better! Keep enjoying this wonderful adventure that God is giving you! We understand completely. Terry’s mother has turned 92 and has had a couple of mini-strokes recently. We are planning a visit to Dayton later this fall. LuAnn your words are like magic melodies transporting me to the sights, sounds and smells of this astounding place. Your photos are incredible. Thanks so much Sue! This place is pretty magical. Thanks Laurel and yes we are still on for Glacier! We are off on the 9th and 10th and I thought I would give you a call. Oh yay!! And we even have good connection for the next few days. We’re in Victoria on a little vacation from Lopez. :-)) I forgot to mention in my last comment that your opening photo is stunning! Is that your sweet summer home? Thanks Laurel. I will pass that compliment on to Terry as he is the one who captured it. And yes, we are staying in one of those sweet little cabins this summer. Talk to you soon. It would be hard to single out a favorite “spot” in Yellowstone, but I too found Lamar Valley to be quietly “sublime.” It was a wonderful antidote to the violent and jaw-dropping landscape of the national park’s geysers, hot springs, and purple mountains. Many of the national parks can be very intense during the peak season. Although the Lamar Valley traffic has picked up these past couple of months, it doesn’t compare with the bumper-to-bumper traffic in other parts of the park. What a beautiful post LuAnn! You took me right there to your special place. I am sure you feel so relaxed and wonderful. I am sure I would love it there! I don’t know you but I do, if that makes sense. Although we haven’t met (yet), having spent time on your blog I feel I know you pretty well. I can say with some certainty that you would love it here. Thanks Anita. Our summer has been one of learning, connecting with the wild spaces, and meeting some amazing people. Your writing is wonderful my friend, I have missed it, coupled with your fantastic photos this is my favourite post of the day! Nature is amazing and you always encourage your readers to appreciate it more. Thank you so much my friend. We have just left the park so I am now among those who live by internet! Hoping to catch up with you soon. “Everything is observed through a microcosm of acute clarity.” What a gift it was for you to spend this summer, far from the noise of our wobbly world, immersed in the serenity of nature. Your clarity, as well as your appreciation is palpable. Thanks my friend. I loved the serenity of Lamar Valley.